Who says no flour means no pancakes? I present you flourless pancakes! Grain-free and delicious to boot. I stumbled upon a blog a couple weeks ago that quickly rose to the top of my favorite blogs list. Green Kitchen Stories is a wonderful mixture of simple healthy food, delicious pictures, and fun stories about life and travel from David, Luise, and Elsa. If you haven't checked it out yet, it's worth a visit! It was on Green Kitchen Stories that I first saw a recipe for flourless pancakes and I knew instantly that I just had to try it. The recipe called for unsweetened coconut, which acted as the "flour" giving substance to the liquid fruit and eggs. It also called for coconut oil, which I had never used but had been curious about for some time. I couldn't wait to try my own version. On Saturday morning, I surveyed the fruit in my kitchen: two bananas, two pears, lots of clementines, and a bag of frozen mixed berries. 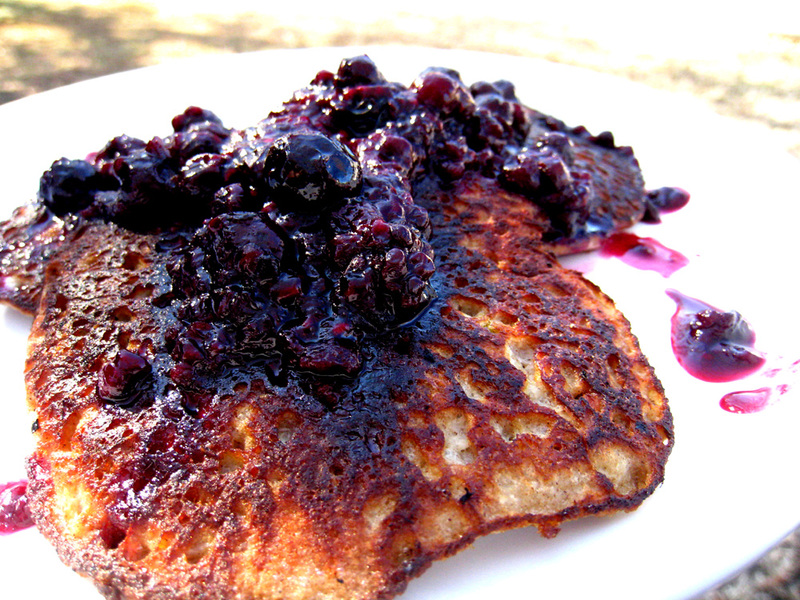 Wanting to use some of everything, I decided on banana-pear pancakes with a berry-orange reduction sauce. Start the sauce first so that it can simmer and reduce while the pancakes are cooking. Put all ingredients in a medium saucepan. Bring to boil, turn heat to low, and simmer about 30 minutes until thick and syrupy. In a large bowl, mix together the coconut and cinnamon until well blended. In a medium bowl, whisk the eggs. Add the bananas and pears to the egg mixture and mash everything up with a potato masher. Add the liquid ingredients to the dry ingredients and stir until well blended. Heat some coconut oil in a frying pan. When hot, spoon the mixture into the coconut oil using approximately 1/4 cup batter per pancake. When bubbles start appearing and popping on the top of the pancake, flip and cook for a minute on the other side. Serve hot with spoonfuls of berry sauce! Does it seem like I've been posting Moroccan and other faraway flavors a lot lately? Why yes, it sure does. And I'll tell you why: because it's winter and winter demands traveling to hot places where the sun blazes and the markets are bustling. And when you can't afford to constantly be hopping over to Morocco or Tunisia or Cuba (oh, how my heart longs to go there), you do the next best thing and you travel there on your senses. The colors, the smells, the flavors...you make all of these come straight to you and land right on that plate that you're setting on the small table by the kitchen window. And just like that, although it may be snowing outside that window, it's suddenly hot and sunny where you are. That's what happens when you cook. 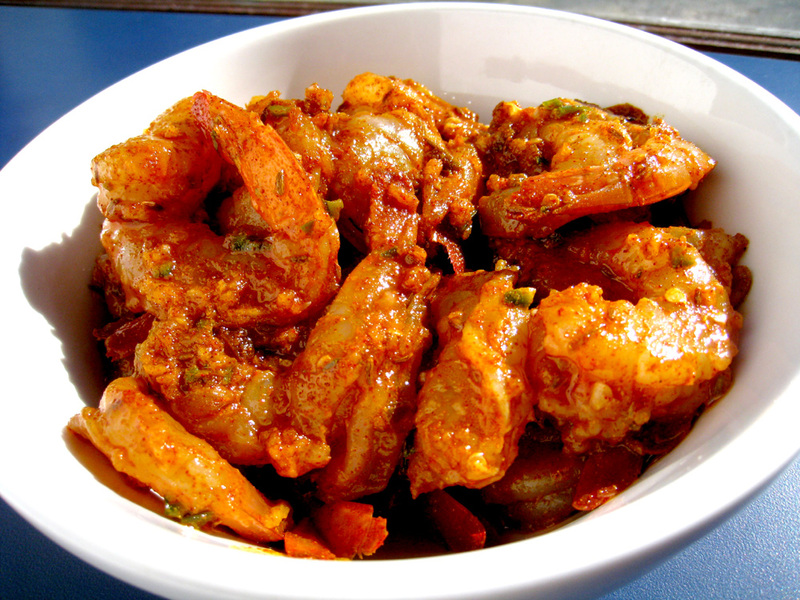 Just like the flavors in this dish. The prunes and honey, like the sweet scent of honeysuckle on a hot desert night, bring a lightness to the depth of the spices. The chilies offer a touch of heat, but only every now and then, when your lips occasionally brush their skin. 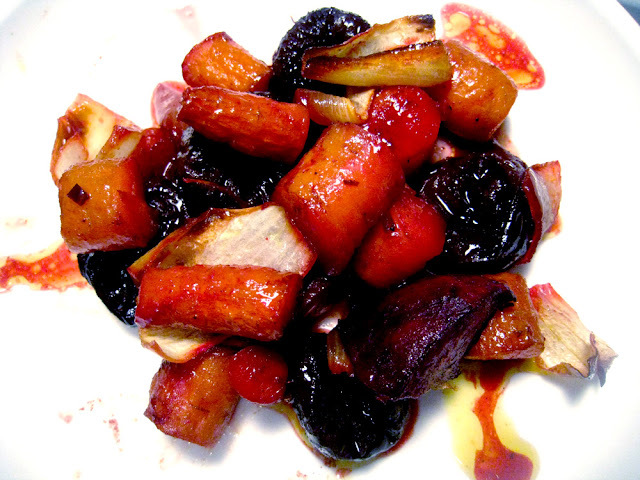 The beets and carrots throw in a satisfying earthiness, just enough to bring you back down from your reverie; or maybe, on the contrary, to plant your feet firmly on that desert sand. Either way, wherever the spices may lead you, it's a trip worth taking. 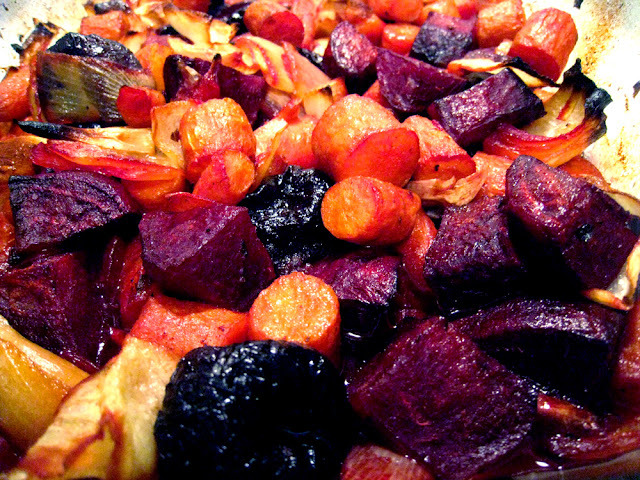 Put the onions, garlic, and beets in a large baking dish and toss with the olive oil. Bake for 15 minutes. Add the carrots, ras el hanout, and chilies. Season and toss well. Bake for another 30 minutes. Stir in the vegetable stock, prunes and honey and return to the oven for another 30 minutes. Delicious (and beautiful!) served with a side of sautéed greens. Mix all spices in a jar. Seal and store in a cool dark place. Yesterday, after two days straight of rain and cold, we were finally treated to the crispest North Carolina blue sky I have seen in a long time. The temperatures decided to follow suit and in the warmth of the Sunday afternoon sun, we drank in the first glimpses of spring. Like the eager daffodils that Josh spotted behind the house, people started popping out everywhere. Cyclists zoomed by on the street, runners broke out their shorts and tee-shirts, and dog walkers came out en masse. We decided to join the crowds and celebrate the burst of unexpected warmth by getting outside and grilling. Grilling shrimp to be exact. 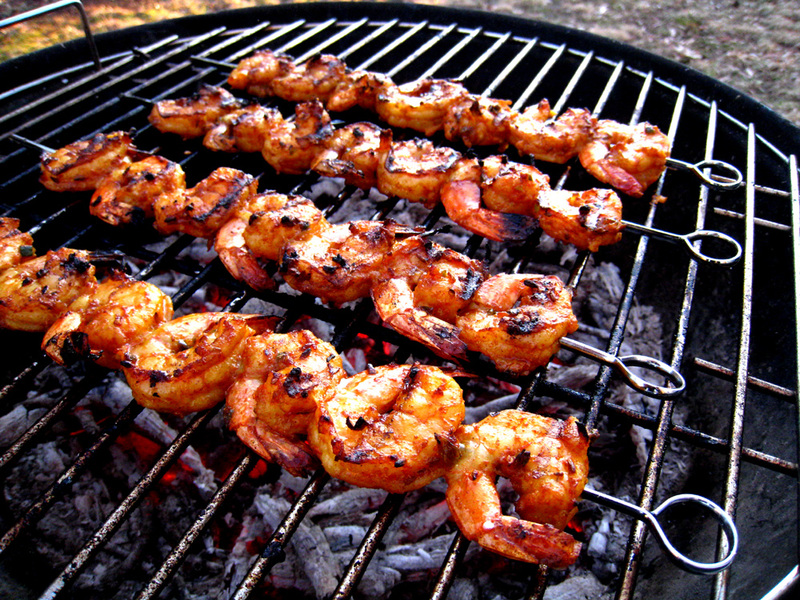 Grilling shrimp with a Moroccan make-you-travel-to-distant-exotic-places marinade to be more exact. This marinade contains spices such as cumin (both ground and seeds! ), paprika, ginger, turmeric, garlic, and fresh chiles that will transport you to faraway lands where palm trees dance and the sand feels hot between your toes. 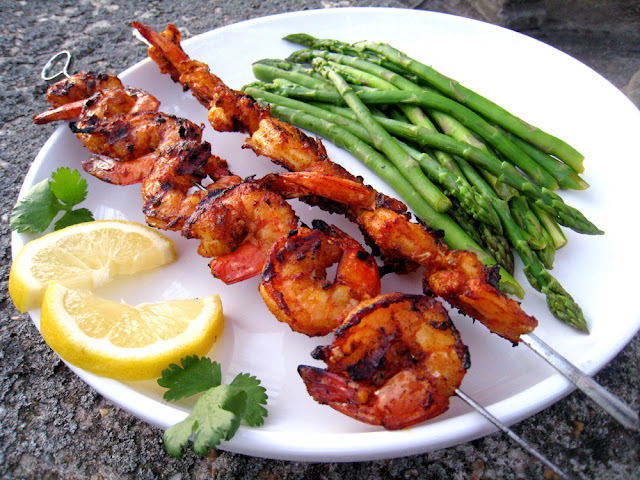 As mentioned, this marinade is based in Moroccan flavors, and although it was quite easy to picture palm trees by an oasis in the desert as I inhaled the intoxicating scent, when I actually bit into the perfectly plump shrimp, it was the Caribbean I was whisked away to. I coud practically feel the salty breeze of the sea cooling my tingling lips. Peel the shrimp, leaving the tails on. Devein them by slitting a thin line down the back of each one and pulling the vein out. Run them under cold water and place them in a colander. Sprinkle with 1/2 teaspoon salt, stir well so that the salt coats all of them. Set aside. To make the marinade, mix the olive oil, garlic, chilies, cumin, cumin seeds, ginger, turmeric, and paprika in a bowl until well blended. Add the shrimp and stir well making sure that all the shrimp are coated. 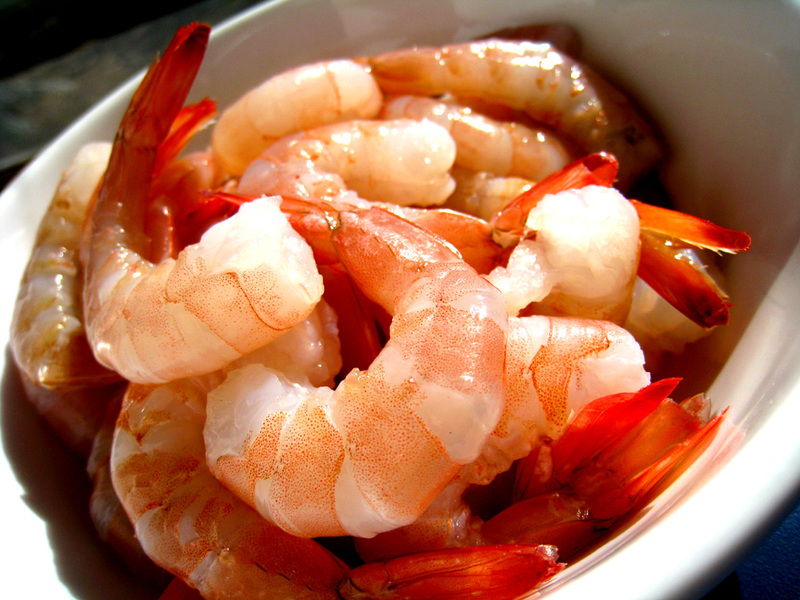 Cover and let sit in the refrigerator for four to five hours (or longer) in order for the shrimp to soak in all the flavors. Skew the shrimp on skewers and grill 2-3 minutes on each side. 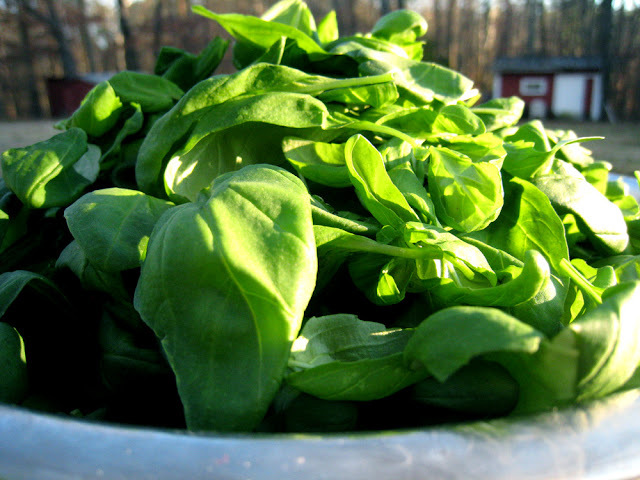 Serve hot with a side of fresh greens. We decided on lightly steamed asparagus, sprinkled with salt and a squeeze of fresh lemon juice. Delicious! Last weekend I sat on the living room floor with piles of fresh basil in front of me, pinching leaves off of bright green stems in the warm afternoon light and listening to Jimmy Buffet sing about white sand and piña coladas. Lost in the smell of summer and images of the Caribbean, I felt very far from January. A brief but delicious escape from winter. I’ve never made pesto in January, obviously. Usually, by this time of year, I’m digging in the far corners of my freezer looking for any remnants of the pesto I made and froze in the summer. I mostly come out of the icy depths cold and disappointed. 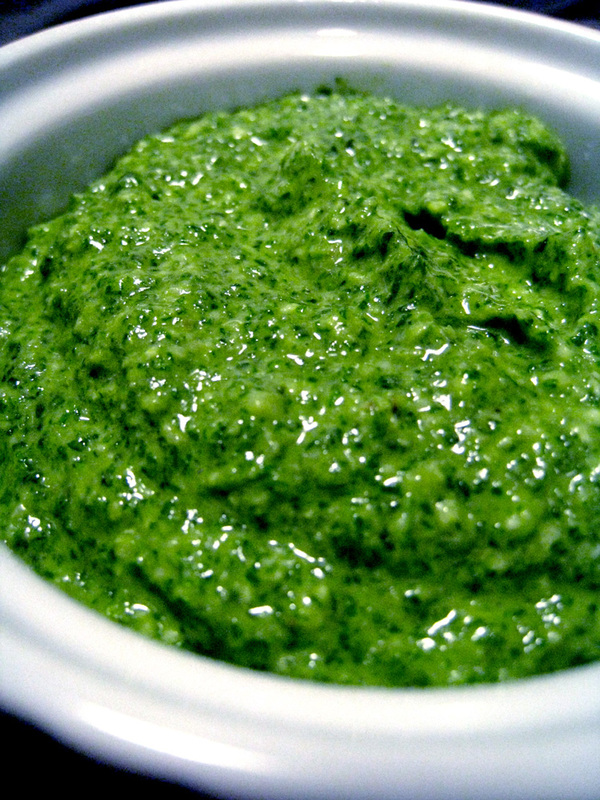 I love pesto; it never lasts as long as I want it to, no matter how much I freeze. But this past weekend, Josh stumbled upon a super sale at the grocery store where they were selling huge boxes of fresh organic basil for under two dollars. (Two dollars!) We couldn’t resist. We bought three boxes. And so, for the first time ever, I made pesto in January. This recipe reminds me of my mom in summer, of sitting at the kitchen table with mountains of freshly-picked basil from the garden, and of spending hours making bright green pesto. I remember watching my fingers slowly turn black as we pinched the leaves off, talking the afternoon away. Sitting there, I couldn't help but imagine the generations of women before us that spent their days working together in the kitchen, sharing stories and laughing as they prepared food that would serve them for the year to come. I remember feeling all warm and tingly inside at the thought of being connected to such generations past, like I was sharing a special timeless secret. Put all ingredients in a food processor and blend until smooth. Taste and adjust seasoning. I love this recipe because it tastes so fresh, like a burst of herbs on your tongue. If you would like your recipe to taste a little less herby, just add more olive oil/parmesan/butter. There's no right way to do this, so have fun and experiment! This makes a lot of pesto. The best way to store it is to fill empty ice cube trays with it as soon as it's ready and put it in the freezer before it oxidizes. Once the cubes are frozen, pop them out of the trays and store them in zip lock bags in the freezer. Now you have ready-made individual servings whenever you want! One week ago, I was sitting at my desk after lunch feeling bloated and uncomforatble. I had just had a bowl of rice with tofu and vegetables and my mind told me I should be feeling great, but I wasn’t. I have had a sensitive tummy from the time I was a little girl, so I’m used to the feeling; but it’s been growing worse lately. It got a whole lot better when I cut out gluten nine years ago, but over the last couple years, with all the new gluten-free baked goods, gluten-free flours, and gluten-free cookbooks out there, I have been eating a lot more starch and grains than I did when I first stopped eating gluten. And over the years, my stomach has gotten worse. Lately, it feels like my intestines twist and turn and yell at me every time I eat anything. So a week ago, I decided I had to do something about it. My body was trying hard to tell me something and it was time I listened. I set to work trying to find possible solutions and after much research, I stumbled upon the book Breaking the Vicious Cycle: Intestinal Health Through Diet. Something in me said this was it: the path that might lead to some answers. The diet in this book - referred to as the Specific Carbohydrate Diet - is one that aims to restore intestinal health by eating a natural diet of mostly fruits and vegetables (some nuts, aged cheese, eggs, and all-natural fish and meat are also allowed), and by eliminating complex carbohydrates that are hard for the body to digest. It pretty much boils down to no grains, no starches, no sugar, and no processed foods. This diet, however, is neither a low carbohydrate one (just low on hard-to-digest carbohydrates) nor a low-calorie one. In other words, it's simply a return to the earth, to whole foods and to basics. It's about listening to your body and feeling what's right for you. My hope is that over time my stomach will return to a healthy state and I can then try to reintroduce certain foods to see which ones work or don't work for me. So I am off to a journey of recovery and renewed health! I, in no way, see this as taking away from fun in the kitchen. I have a feeling that with some creativity and a willingness to tread the unfamiliar, it will be a ton of fun. So I look forward to posting new and exciting recipes that will (hopefully!) make tummies all over feel like dancing a happy dance. Here's to Health and listening to these precious bodies of ours!